Autoimmune disease affect up to 50 million Americans, according to the American Autoimmune Related Diseases Association (AARDA). An autoimmune disease develops when your immune system, which defends your body against disease, decides your healthy cells are foreign. As a result, your immune system attacks healthy cells. An autoimmune disease can affect one or many different types of body tissue, depending on the type. It can also cause abnormal organ growth and changes in organ function. There are as many as 80 types of autoimmune diseases. Many of them have similar symptoms, which makes them very difficult to diagnose. It’s also possible to have more than one at the same time. Autoimmune diseases usually fluctuate between periods of remission (few or no symptoms) and flare-ups (worsening symptoms). Currently, treatment for autoimmune diseases focuses on relieving symptoms and preventing complications because there is no curative therapy. type 1 diabetes: destruction of insulin-producing cells in the pancreas. What is known, is that genetics is a factor. You may be more susceptible to developing an autoimmune disease if you have a family member with one. Because there are so many different types of autoimmune disease, the symptoms vary. However, common symptoms are fatigue, fever, inflammation, and general malaise. Symptoms worsen during flare-ups and relent during remission. Autoantibody tests: These are any of several tests that look for specific antibodies to your own tissues. Antinuclear antibody tests: This is a type of autoantibody test that looks for antinuclear antibodies, which attack the nuclei of cells in your body. Complete blood count: This test measures the numbers of red and white cells in your blood; when your immune system is actively fighting something, these numbers will vary from the normal. C-reactive protein (CRP): Elevated CRP is an indication of inflammation throughout your body. Erythrocyte sedimentation rate: This test indirectly measures how much inflammation is in your body. 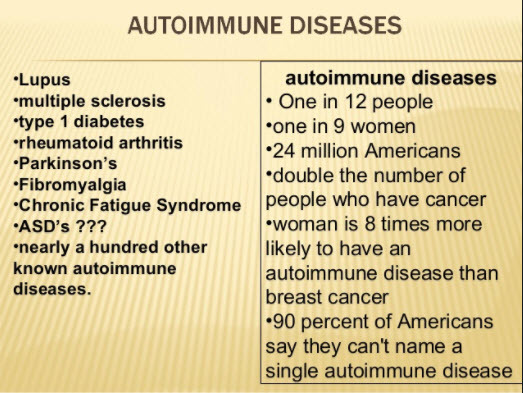 Autoimmune diseases are chronic conditions with no cure. Treatments try to controlling the disease the by relieving the symptoms, especially during flare-ups.